Results out for Great Backyard Bird Count 2014! GBBC 2014 was a record event for India! Over 1,100 birders participated, contributing more than 3,000 lists, which contain observations of 823 species — this is the largest number of species contributed to the GBBC by any country in the world! Visit this link to see the results for GBBC India, lists of participants, and other interesting details. Many thanks to all who contributed! But the story doesn’t end with GBBC. Here is an exciting activity for all of us to take part in — the eBirding Challenge for India — which started on 1 April 2014, and will continue all through the year. 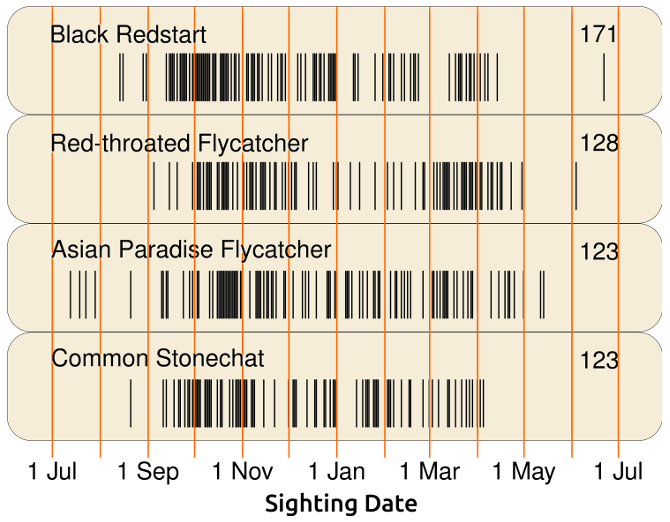 In continuation with our presentation of present arrival patterns of our most-reported species, we now feature Black Redstart, Red-throated Flycatcher, Asian Paradise Flycatcher and Common Stonechat. As in previous summaries each sighting is shown as a vertical black line. Does the Pied Cuckoo herald the monsoon? Does the arrival of the Pied Cuckoo herald the onset of the monsoon? The Pied Cuckoo Campaign was launched in 2009 to collect information to assess this age-old belief. More than 600 sightings of this wonderful migrant have been contributed by over 200 MigrantWatchers so far; the first sighting dates among these were compared to monsoon arrival, as available with the Indian Meteorological Department (see the graph alongside). Each dot shows the earliest Pied Cuckoo report (after 1 May) for a broad location (an area roughly 200 Km across). 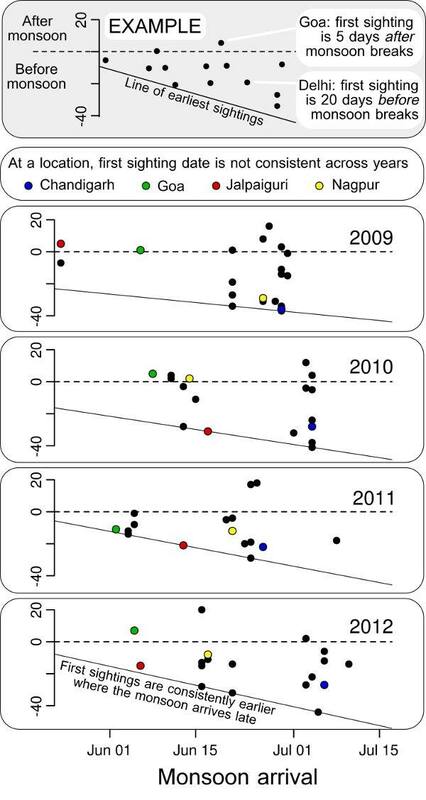 The results are fairly clear: Pied Cuckoos arrive before the monsoon in most parts of central and northern India (they are resident in southern India). You can see this from the pattern that most dots in the picture to the right are below the dotted horizontal line. But the degree to which the arrival of the Pied Cuckoo precedes the monsoon varies from place to place, as can be seen from the scatter of the dots within each year. And even for the same general location, this varies from year to year (see how the coloured dots are in different places in different years). What appears to be happening is that, where the monsoon arrives early, Pied Cuckoos arrive a few days before monsoon onset; but where the monsoon arrives late, the cuckoos arrive well in advance of monsoon onset. So, overall, the old belief is true, and Pied Cuckoos tend to arrive before the monsoon — but to different degrees, depending on when the monsoon begins at each place. Also see this article on Pied Cuckoo migration.